By Sally JenkinsUsain Bolt’s frisky relationship with Olympic solemnity is some of the best entertainment at the London Games. But when it comes to ranking the greatest Olympians ever, Bolt is nowhere near the top of the list. The worship Bolt shouts for belongs more rightly to a 100-year-old dead man who hardly ever spoke up for himself, Jim Thorpe. Bolt has sprinted hard into immortality; he is indisputably the fastest man ever, and maybe one of the most cheerful, too. It doesn’t hurt that he knows how to freeze for the cameras while we’re still trying to recover from the breathless shock of watching him run. But Bolt himself knows that his claim to sit atop the Olympic pantheon with double golds in the 100 and 200 is nonsense. His boasting, “I am the greatest athlete to live, I am a living legend, bask in my glory,” was just a lot of noisy post-victory exultation. He may not even be the best in the Olympic stadium according to the decathletes. “Just because you’re fast doesn’t make you an athlete,” silver medalist Trey Hardee said. First of all, so many athletes crowd in at the door and jostle for space in the Olympic pantheon that before you can name one above all the others, you have to group and categorize them. Second, these discussions invariably fail to give proper credit to the historical greats. “They skew towards the modern athlete, because no one remembers,” says Olympic historian Bill Mallon. When you talk about greatest Olympic athlete do you mean the one with the most medals? That’s Michael Phelps with his 22 doorknockers hanging around his neck, including that masterful, testing eight in a fortnight at the Beijing Games. But Phelps has the advantage of being able to enter multiple events and claim relays. In which case you might prefer Larisa Latynina, whose 18 gymnastics medals for the Soviet Union at the 1956, 1960 and 1964 Olympics were the record for almost a half-century until Phelps broke it.Jenkins goes on discuss other contenders before returning to Thorpe:Or do you find these definitions too limiting? If what you mean by greatest Olympic athlete ever is someone who displayed such a timeless virtuosity, a combination of agility, stamina, strength, speed, endurance and range that it’s never been matched, well, that’s Thorpe. His performance in the 1912 Stockholm Games has the quality of footprints disappearing in the sand thanks to the International Olympic Committee. It stripped Thorpe of his victories in the now-obsolete pentathlon (five track and field events in a single day) and decathlon for committing the sin of professionalism, when it was discovered he played minor league baseball in Rocky Mount. What survives are some cool gray numbers marked by asterisks, and some half truths. It’s hard to envision what Thorpe did, as long as you think of think of him as a long-dead ghost, or a quaint historical photo. When you think of him you have to think of someone alive. As alive as, say, Bolt. When you think of Thorpe, think of him that way. Or think of Bo Jackson, or Deion Sanders—only stronger. If you want to bask in glory, bask in this: Thorpe competed in 15 events—and won eight of them—despite losing his track shoes and competing in a mismatched pair, running on a cinder track in a slogging rain. 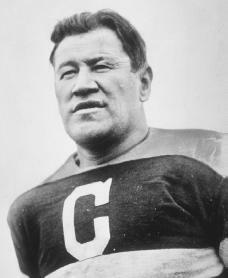 He still turned in a time of 11.2 seconds in the 100-meter dash, which wouldn’t be equaled until 1948.Comment: For more on Jim Thorpe, see Best in the World at NMAI and AMC Develops Carlisle Football Drama.